I have bats in my attic. For anyone who knows me well, the idea of “bats in my belfry” isn’t hard to swallow. But seriously, I do have bats in the crawl space above my entryway and dining room. Probably not that many of them, but when one has any, it’s plenty. Every morning as they return to their summer home from a night of bug catching, they don’t just hang themselves on a rafter and go to sleep. Nooooo. They have activities that take place. 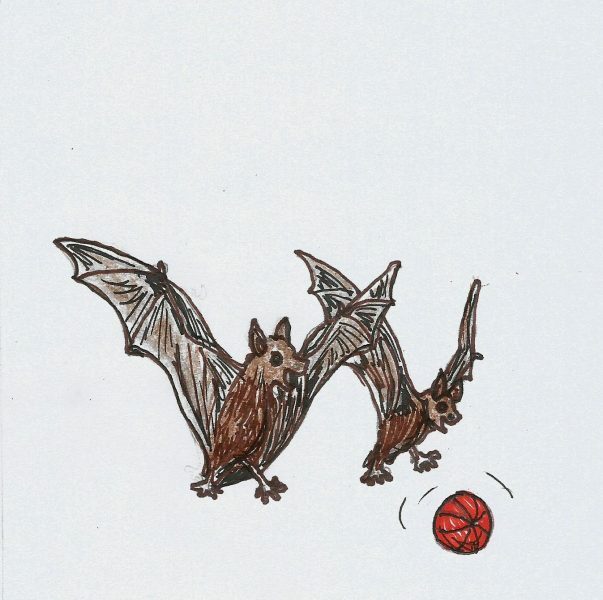 Besides Mama bats taking care of their young, there are bats doing a zoomba class, and teenage bats playing rugby. They are noisy. There’s lots of clumping around, scratching sounds, thumps, and murmurings. Early this spring, before the bats returned from wherever they go for the winter, I plugged in the sonar unit in the crawl space, said to repel bats. Right. It must have just annoyed them mildly or at the very least, got in the way of a bat soccer game or something, because one morning they tipped it over. How rude. I can envision the unit being spray painted with bat graffiti and other disrespectful behavior. When it went clunk/bang up there, I wondered just how big they are. I actually like and appreciate bats. They eat a tremendous amount of flying insects every night and are interesting to watch in the yard light’s light. Like little fighter pilots, they negotiate the tree branches, roof lines of the buildings and power poles with such finesse that it’s just amazing. I know that the mosquito catching alone makes the outdoors much more pleasant at night while we’re enjoying our lawn chairs. So,I want the bats to live here. JUST NOT IN MY ATTIC! Folks have given me all sorts of advice on how to deal with them. Everything from burn the house down (someone apparently really doesn’t like bats) to playing loud music in the attic. I do suspect some of that stuff they call music these days could drive me out of the house, let alone bats. The logical idea is to seal up the hole they’re getting in and out of. Right. Bats, despite their noise level, really aren’t that big. The holes that I’ve verified they’re using are no bigger than my pinky finger. Like mice, they can apparently fit their bodies through any opening they can fit their head into. This house is old. It has been added onto several times over it’s near hundred year lifespan, and as you might expect, it has lots of holes the size of my pinky finger. Plus, I don’t want to plug all these holes with spray foam sealer with the bats inside. I don’t think the smell would be that pleasant when they died, plus I really don’t want to kill them, though I’ll invariably kill some babies by locking the mamas out. So, that puts me on a ladder at night filling holes. That’s my fondest dream right there. I’m not paranoid about ladders, the fact is, my knees aren’t that spiffy anymore and ladder climbing and descending is a challenge at best. The main crack they are using is, of course, on the taller side of the house too. Couldn’t be on the side with the nice level cement to put the ladder on. Nope. Sloping ground that is very uneven. My plan is to fill all the holes that are secondary holes in the daylight, then after dark, climb the extension ladder to fill that main entrance. Then hope that I got all the holes. There are many other places in the outbuildings for these bats to live in and be welcome. There are, in fact, bats already around them. So, they have options. I do not. So, it’s me or the bats in this house and I’m not leaving. I want no bats in my attic. I’m used to the ones in my belfry.